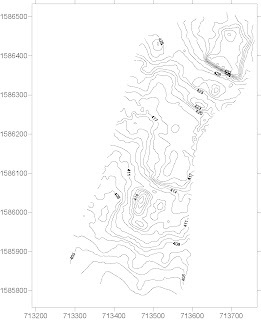 One of the more grueling tasks that Hector Neff took on during the project was the topographic mapping of Bilbao. 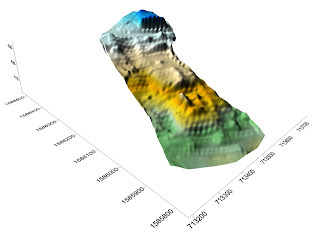 Walking in systematic 10 meter transects across the deposit and using our Trimble Pathfinder Pro XRS he was able to generate GPS data for most of the area. I then post-processed the data using a public basestation in Guatemala City. The results are actually fairly remarkable. Although there are some odd effects that need to be blanked out (edges in particular) and some strange zig-zags (need to edit the grid), the map is fairly representative of what the place looks like. Compare these to the blimp photos below.